Summary: There are a variety of guidelines you must follow in order to get your page to stick. Having a Wikipedia page for your company can be an effective way to improve your overall SEO. However, there are some strict guidelines that you must adhere to if you want your page to stick. This guide will help you get started. Before you start writing content for your page, you’ll need to brush up on the do’s and don’ts. The editors at Wikipedia take each page seriously, so be sure you adhere to their instructions. You’ll need viable sources that provide legitimate proof backing your content. The editors want to see substantial evidence that what you’re saying is actually true. If people have written about your company on the Internet, they need to be trusted sources that have some sort of reputable status. Wikipedia is not a place to advertise your services or products. Any hint of this will get your page instantly deleted and all the hard work you’ve put in will go to waste. Don’t promote your business. Rather, write about the notable accomplishments and history of your business – but be sure to back it with sources. As stated above, you’ll want to search the Internet for sites that have written about your company. It’s important to do this prior to starting so you know what you can include and what you can’t. Sure, your company might have done some impressive things but if you can’t prove it to the editors, they’ll basically have to take your word for it – and they won’t. Blog Submitted by Pierre Zarokian. 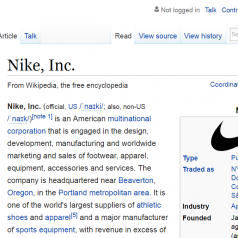 Does your company need a Wikipedia page detailing the achievements of your company? Leave it to Pierre’s company at Submit Express. With decades of experience on their side, you’ll be in good hands.